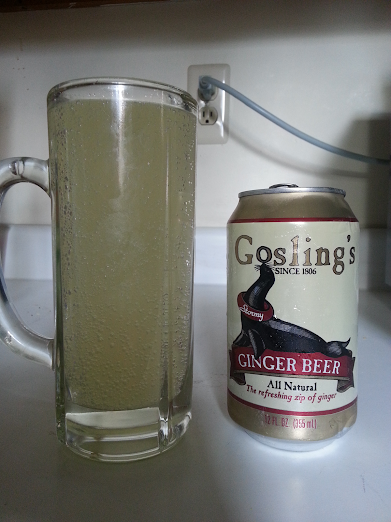 There are two differences, in my experience, between ginger ale and ginger beer: ginger beer has a much stronger ginger flavor, and it also usually has a ‘stickier’, more cloying sweetness. Usually, there’s a third difference; ginger beer is darker. Gosling’s follows the pattern for the first two. 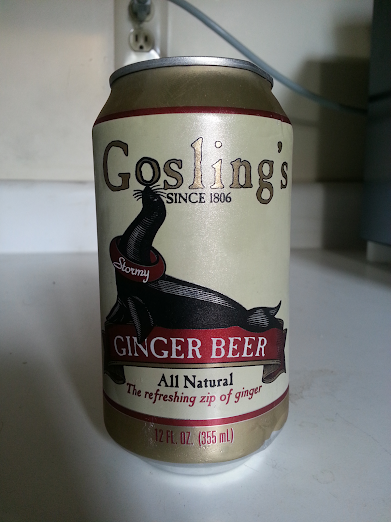 It differs from other ginger beers that I’ve encountered in that Gosling’s doesn’t color the soda into a darker version of the light amber that has become the ‘conventional’ color of most ginger ales. If it weren’t cloudy, Gosling’s would be a clear and colorless soda; the cloudiness makes it a color best described as off-white. It lets a small amount of light through, but not enough to make out the shape of the logo that’s on the back of the stein pictured. It is moderately carbonated, forming a layer of bubbles on the inside of the stein that are renewed as they break off and float to the top. The bubbles are larger than those seen in MASH or GuS. It does not seem to leave me with a big bubble to burp up. The flavor is intensely ginger, much more so than any ginger ale, but consistent with most ginger beers of my experience. This is nothing less than the liquid version of crystallized ginger. I actually like this a little better with about 10% lime juice; it cuts the sweetness and adds a citrus tang. Lemon juice would probably work as well. I’d drink this with just about anything, but when cut with lime, it goes very nicely with a curry. I found this at the lobby concession at the Brooklyn District Attorney's office. if you don't mind your ginger beers on the sweetish side, "bundaberg" is excellent. very smooth, very satisfyingly gingery. I do love my Bundy! You lost me at HFCS. Thank you for putting that information into your review. I can find this at my local Giant Eagle (a store that would be sort of a Wegman's and sort of a Stop 'n Shop, depending on which one I go to). I'm not as taken with Gosling's: too sweet and too carbonated for me. But I'm not a big fan of carbonation at all, so I just don't like nearly all sodas.